Use the SmartAVI HDRULT-IR16 to control matrix switching up to 16x16, with simultaneous control of up to 16 input devices, via infrared. The IR-Blaster features full matrix signal routing so that each IR input can be routed to any combination of IR outputs. Additionally, each output can drive the IR emitter up to 30 feet away. The router is fully compliant with standard modulated IR protocols and the latest IRDA standards. The IR-Blaster provides a second function that makes it a must-have device in a wide variety of situations. 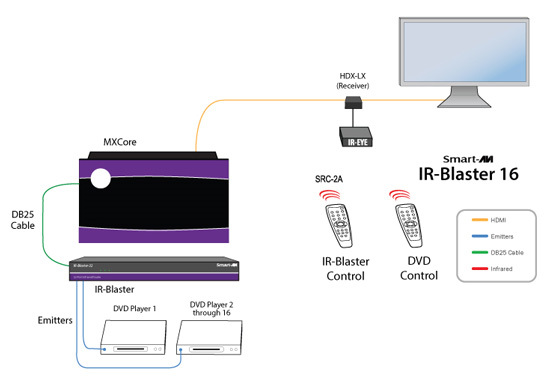 By connecting IR emitters from the IR-Blaster to input source devices - like Blu-ray players, HDTV cable boxes and more - users can operate the source via its own specialized remote. Changing channels, adjusting volume, skipping chapters, operating DVR and more can be managed by the remote control just by pointing it at the conveniently located IR-Eye. 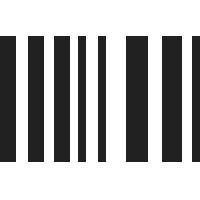 The IR-Blaster then sends the data directly to the input source for instantaneous device control. The combined functionality of the IR-Blaster - remote matrix switching and input source operation - makes it crucial for A/V distribution chains where the matrix and its devices are kept away from where the user needs to manage the displays. The IRBlaster is a handy, easy-to-install product that transforms the use of a matrix in almost any environment. It only requires the additional SmartAVI remote alongside the input source's remote, and then users can efficiently and effectively control a wide variety of audio and video.